This chicken-satay recipe has more flavor than you typically get when ordering this popular appetizer in a restaurant. Serve with Peanut Sauce and Cucumber Salad. Combine all ingredients except for chicken. Add chicken and marinate for 1 to 2 hours in refrigerator. Meanwhile, if using bamboo skewers, soak in cold water. Skewer one piece of chicken on each skewer. Preheat gas grill or charcoal grill to medium heat. Grill skewers for 2 to 3 minutes on each side, or until just cooked through. Serve hot from the grill. The chicken can be left in the marinade for up to 24 hours before grilling. 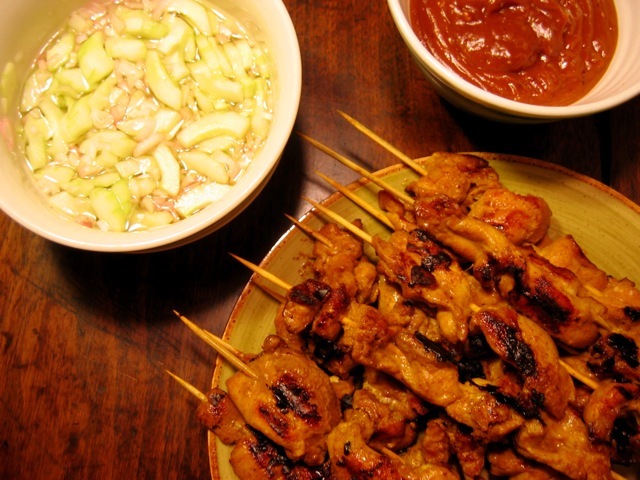 For a moister, richer satay, use strips of chicken thigh instead of breast. You can substitute an equal amount of lean pork, beef, or shrimp for the chicken. For shrimp, marinate for only 15 to 20 minutes. Adjust cooking time as needed.